Expected approval for the construction of the pipeline has recently faced renewed, strong opposition, and president Obama – the ultimate decision maker in this case – has set a high hurdle for the approval: it has to be proven that the pipeline will be emissions-neutral in order to get approval; a fairly high order for an energy project, since by definition energy projects suppose to create energy and (most unfortunately emissions; that’s how humans have learned to make energy.) For now, any decision has been pushed back for the spring next year, but some smart money has started hedging their bets. The Keystone XL pipeline, whether it gets built or not, whether sooner or later or maybe never, can have implications in the shipping industry, whether for the international flag or Jones Act tanker markets. In a previous post, we discussed the possibility that the Canadians may augment and add new mileage to the pipeline system from West Canada / Alberta heading west to the open sea in an effort to sell their oil to the international market (read China). Kinder Morgan has been working on the TM Expansion to Burnaby (BC) / Anacontes, but the new pipeline project of Enbridge Gateway seems to be running against its own wave of (environmental concerns and) opposition. 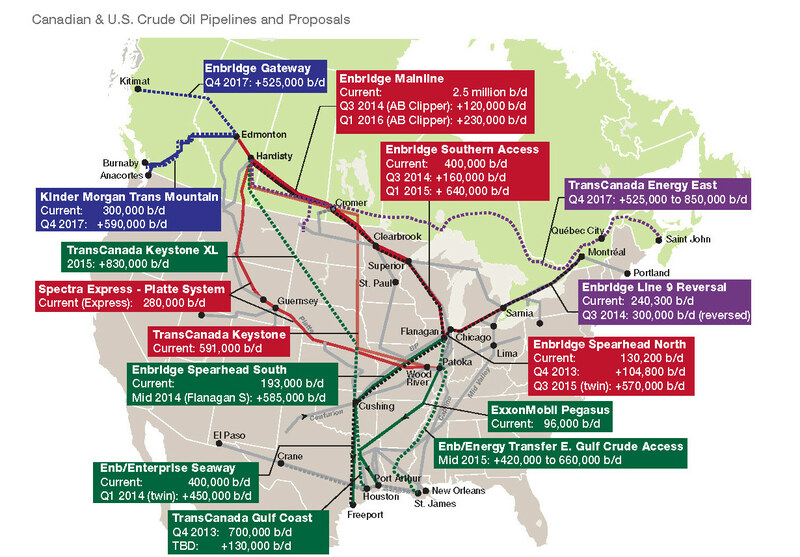 The proposed TransCanada Energy East pipeline project (mostly based on converting natural gas pipelines to crude oil pipelines, about 2,800 miles of pipeline, and 1.1 million b/d) could bring Canadian oil eastward and along the border with the US to Québec City and St John, for local processing partially, but mostly for international exports. The TransCanada project could be technically more challenging going through harsh terrain and given the length of the project, the cost of building up the pipeline can be very expensive. There have been rail routes with substantial spare capacity going both west and east of Alberta, that can theoretically substitute for the pipelines, and they have been doing terrifically in the short term, in terms of capacity and also allowing rail companies to show superb earnings reports. Canadian oil heading west or east, whether through a pipeline or in rail cars, it will be a positive development of the international tanker industry, as such oil could be loaded on international flag tankers to head west (China and the Pacific Rim, possibly benefiting VLCC and Suezmax tankers), and possibly in smaller quantities moving south onto the few refineries on the US West Coast (USWC), likely benefiting aframax sized tankers. 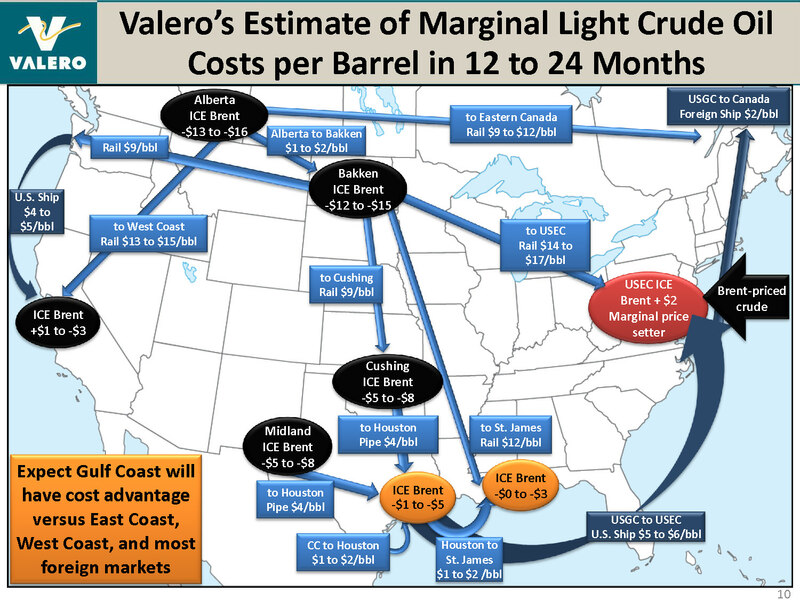 Crude oil from East Canada, most likely would – given its heavy nature – find buyers in the refineries of the US Gulf Coast (USGC) and international flagged aframax tankers likely would be the main beneficiaries. Construction of the Keystone XL pipeline likely will be a great benefactor of the Jones Act tanker and the international flag product tankers. Unlike crude oil produced in the US that cannot be exported according to US law, Canadian oil reaching the USGC through the Keystone XL pipeline can be exported (of course, depriving the US of the benefit of accessing plentiful oil.) 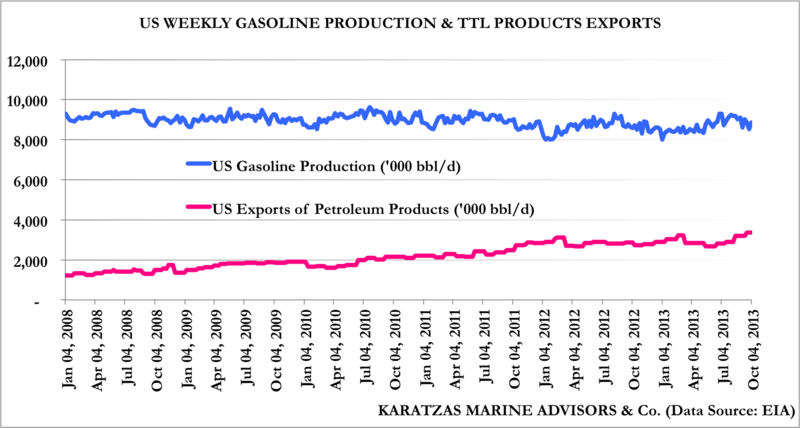 However, based on the economics of the business, given that Canadian oil is heavy and refineries along the USGC are geared toward processing heavy oils (and that’s how they achieve superior margins), Canadian oil coming out of the Keystone pipeline most likely will end getting processed domestically, depriving international flagged crude oil tankers of the potentially new trade. However, the Jones Act trade, whether for crude oil or refined products would benefit having to move bigger volumes along the Gulf Coast, around Florida, and the Atlantic and East Coasts. Also, international flagged product tankers would be the other beneficiary of the pipeline based on additional refined product exports. 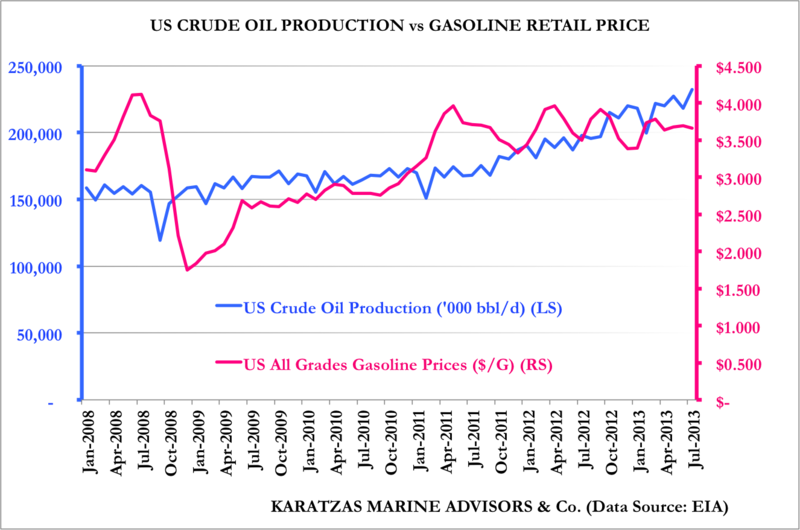 However, for international product tankers, this may be a mixed blessing and minor negative trade-off from their currently great state where USGC refineries process more West Texas Intermediate (WTI), Louisiana Light Sweet (LLS) and other top quality grades, resulting in higher production of diesel and a better (triangulating) export trade with Europe, as discussed in previous post. This entry was posted in Jones Act Market and tagged aframax tankers, Basil Karatzas, heavy oil, Jones Act tankers, Karatzas Marine Advisors, Keystone XL, LLS, shale oil, suezmax tankers, TransCanada Energy East, VLCC, WTI on October 2, 2013 by Karatzas Marine Advisors & Co..
Jones Act ‘Product Tanker’ Market: The Contagion Effect? Last time the Jones Act tanker market made front-page news was when ExxonMobil ordered in 2011 two 115,000 dwt aframax tankers at Aker Philadelphia at the announced price of US$ 200 million each. It has been reported that the vessels are ‘full redundancy’ specification with two (fuel efficient) engines, two propellers and two rudders, and of course equipped to the latest standards of technology and navigation; the transaction had ma news for the high construction cost of the vessels, when mainstream tankers from top-quality foreign shipbuilders could be had at the time at US$ 50 million per vessel; for ExxonMobil’s high standards for vessels trading in the particularly sensitive Prince Williams to California route, we surmise the cost to had been below US$ 100 million per copy from high quality international builders. However, ever since the introduction of hydraulic fracturing technology (‘fracking’) and the discoveries of huge deposits of shale oil in the US in the last four years, the Jones Act tanker market has been a major beneficiary of the structural changes for the crude oil and petroleum products trade. 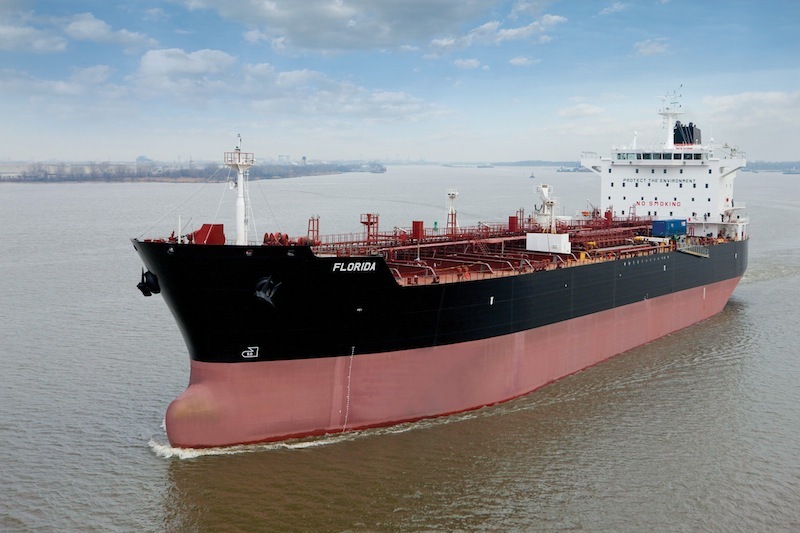 The market was caught off-guard and undersupplied, with reports that at least in one instance, a Jones Act product tanker trading crude oil managed to get a one-year fixture at US$ 100,000 per diem by a major oil company. 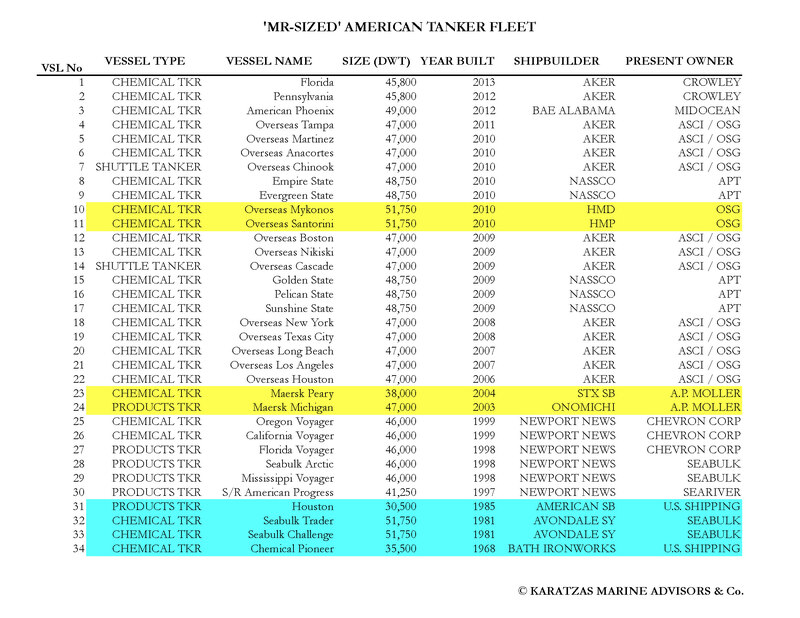 According to data tabulated by Karatzas Marine Advisors & Co. (as per table herebelow), there are presently 34 ‘MR sized’ Jones Act tankers, two of which are shuttle tankers and four are US-flagged only; 30 of these tankers may be considered ‘modern’ with an average age of the fleet of less than seven years. No doubt that the economics of the Jones Act tanker market seem fabulous at present (US$ 100,000 pd gross freight revenue, less approximately US$ 22,000 pd vessel operating expenses, on US$ 120 million cost basis but with overall cost of capital well into single-digit territory and long asset economic life); but 50% outstanding orderbook of the existing fleet doesn’t seem like moving into ‘dangerous’ (oversupplied) territory? After all, we all in shipping know what happened when the orderbook for foreign-flag vessels reached historically high levels… unless of course it turns out that we are experiencing an once-in-a-lifetime ‘game changer’ event with the discovery of shale oil, that political risk is low (of allowing crude oil to be exported overseas) and the Jones Act tankers market turns out to be fully insulated from international shipping economics. This entry was posted in Jones Act Market and tagged Aker Philadelphia, Alaska Tanker Company, American Petroleum Tankers, Basil Karatzas, Basil M Karatzas, Blackstone, Crowley, Jones Act, Karatzas Marine Advisors & Co., NASSCO, OSG, product tankers, shale oil, tankers on August 10, 2013 by Karatzas Marine Advisors & Co..